Oscar Night is a night that just screams out for elegant bites, don’t you agree? So, These dressed-up and gift wrapped bites are perfect. And Sandy – They are easy enough that you won’t have to miss any of the Red Carpet glam! HOOO-ray! This idea was inspired by Martha herself in Martha Stewart Living. She made Shrimp Mango Bites by wrapping a thin piece of mango around a grilled shrimp and tied it up with a softened green onion. Really, green onions are just perfect for bow-making, aren’t they? I switched up the mango and used roasted red bell strips (cinchy if you buy a jar of these!) with the green onion bow. This is one of the easy elegant recipes in our book 200 Appeitzers – plus 199 more! You could make these even easier by just making the spicy shrimp and then tying it with a softened green onion (skipping the bell pepper strip). I like red bell pepper because it adds a little sweetness. These are seriously the cutest little bites I have ever seen. They look adorable on a party platter, and the flavors are perfect together – spicy shrimp, sweet bell pepper and the green onion tang. The only tricky part of this recipe is that the shrimp need to be wrapped tightly into a sprial before they are cooked. So. I rolled them into a ball and then put a toothpick through them to make them cook in a tight spiral shape. Roll each shrimp into a round shape, with tail on outside. Skewer each rolled shrimp with a toothpick through the diameter, so that shrimp hold their round shape. Heat a saute pan to medium high heat. Add oil. Coat shrimp with spices and then saute just until opaque, about 1 to 2 minutes per side. Remove from pan and let cool to warm. Cut 12 strips of the green portion of the green onions off, keeping the green portion in tact and as long length as possible. Heat green onion strips in pan until just softened and bendable, about 1 minute, turning frequently. Remove from pan and let cool to warm. Cut bell pepper strips into long thin strips and wrap strips around shrimp. Wrap green onion strips around shrimp and tie in a bow or in a knot. Thanks Judy – I love festive food! This is exactly the gift I’d like to receive. 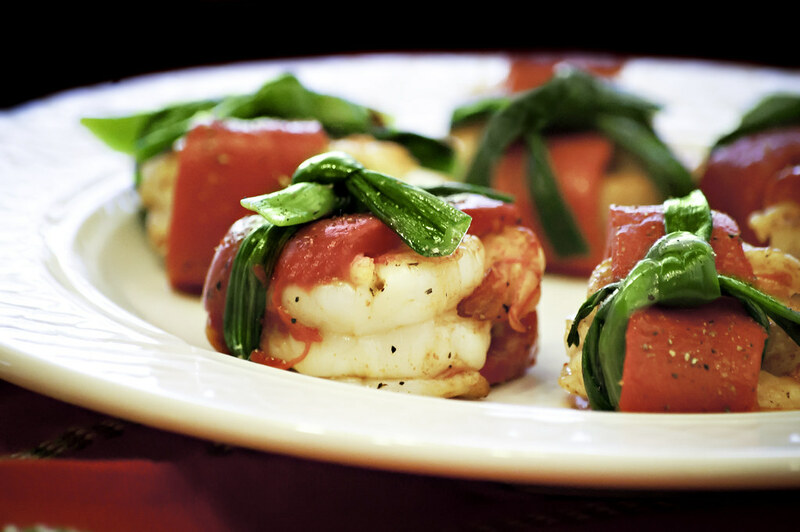 These look fantastic and would be the perfect appetizer for Oscar night. Fun idea! Your foods look so delicious! And beautiful! Love your site, I’m inspired! I love roasted peppers, yum! You are most kind, Tahny! We are so happy you stopped by!